Mindestens Haltbar bis 31.12.99 is translated as "Best Before 12/31/99." 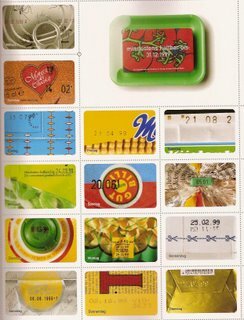 It is a calendar designed by Juli Gudehus in which she uses nothing but photographs of expiration dates from food products to represent the date for each day. The printing techniques of the expiration dates range from embossed, debossed, stamped, letterpressed, flexi-printed, and ink-jetted. The viewer is able to see a wide variety of colors, textures, and typography that are combined differently within each card. This reminds me of the typeface journals that we made in 200 level typography. Gudehus photographs seem quickly and randomly taken, however, she takes great consideration in making sure that the expiration date is the main focus while still giving the viewer enough information to guess what the food product is. The presentation of the calendar adds another level to the design. Each date is printed on its own card, and all the cards are combined into a deck of cards which are then placed onto a green styrofoam food tray and then shrinkwrapped. Not only is this calendar fun to look at, it is fun to hold in your hands and flip through the deck of cards. It is kind of like a guessing game for the viewer. This interaction is what sets this calendar apart from ordinary calendars. It serves as more than a calendar, so after the year is over, you will most likely not throw it away. i think this is a very clever idea. she's given us a new interpretation of this detail that we see everyday but usually take little notice of. i like the way the images are cropped so that you have to take a minute to figure out what product the packaging is from. i like the vibrance of color in the photographs. i also like how she gave so much thought to the form of the calendar so that it is something the viewer can interact with. it becomes a different experience than just an ordinary calendar. id be interested to know what her process was with this design.it seems like it must have been fun to create. A ingenious concept, that being a different product goes bad on every calendar sheet on everyday. She leaves just enough of the product cropped to suggest its contents and to put more emphasis on the expiration date. In society full of consumption she finds the inspiration to use the products to tell a narrative through their dates of expiration. It is a method of layering information to reflect on our culture of consumption that she is mediating with the products packaging being exposed to the viewer. There's another work that I find interesting in that same section by Juli Gudehus's : Genesis the telling of creation with cooperate logos, directional icons, and pictograms. I start to consider that people in our culture can identify with iconography because of the symbolism that is attached to them. Probably globally because of the connotations placed on these logos. WOW, this is indeed a very interesting design piece, that is something that would not have thought of myself. it is such a creative idea, yet, if you think about it, it comes down to a simple process ultimately. there is also the connotation that each day itself expires like the dates on the packaging that is photographed for that day. and not only is each day treated uniquely, in terms of photograhy, but to have all the days able to be punched out and be put into a tin can, that is something that ensures the longevity of the interaction. it now becomes a salvagable artifact to preserve for years to come! I agree to carley how the images are being cropped out in an interesting way. It gives you just a bit of a hint to guess what the product is, and does not overwhelm the expiration dates which is the main focus of this project. Each one of them has different techniques of labeling the date and looking at them separately might not mean anything but it's interesting when it's combined all together as one piece where the dates work as a system. 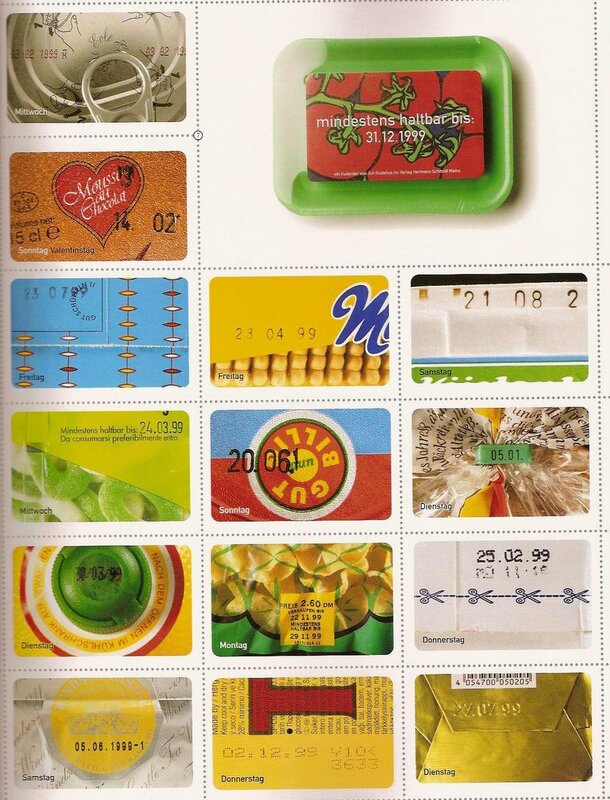 It also tells me, by using different products it also has the meaning of each day, each year being different.